BRIO sold their first toys in 1907 and has built up an enviable reputation as a reliable supplier of safe and high quality toys. Offering durability and great play value, many of their toys are handed down through generations of kids. 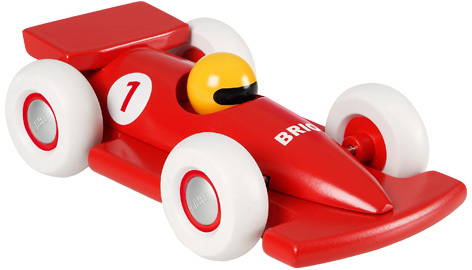 This newest version of BRIO’s famous racing car series is painted in a super glossy bright red paint that makes it look like the coolest racer around. With modern side-pods plus front and rear wings, the number one roundels indicate this a real winners racing car. Rounded edges and chunky looks make this a perfect gift for all Formula 1 mad kids. Robust enough to withstand the inevitable crashes, the easy to grip surfaces are perfect for all kids aged 1 and over. The yellow driver’s helmet may remind some people of Lewis Hamilton, and the red colour of Ferrari, although the BRIO Racing Car will look at home in any family environment. Please tell us what you think of the Brio Racing Car by BRIO and Marbel.